« Science Bloggers vs. Science Writers Round 2: It’s Just A Theory dept. Bloggers v. Journalists round three: the agony of victory. This is becoming the gift that keeps on giving, (think cod, consumed after perhaps just a little too long on the slab….) but whilst taking a break from the transition from an almost collapsing old Dobbins of a powerbook to a gleaming, steaming new MacBook Pro, I chanced to read Bora’s latest on the eternal war between the digerati and the formally fittest ink-stained denizens of the Juraissic. The inciting incident was an unfortunate piece by an op-ed writer from the Newark paper, published in the opinion section of The Wall St. Journal. Bora is right; it’s about as uninformed and fact-less a piece of bloviation as I’ve seen in a long time. But I have to say that Bora’s cry of rage seems to me a bit off. You’ve won, dude, and the unfortunate Mr. Mulshine’s piece should properly be read as an acknowledgement of that fact. And in focusing so much time and fury on this one pathetic plaint I think Bora has in fact missed two key issues. The first is that Mulshine himself, and his venue as well, are not journalistic enterprises. He’s an editorial writer, a species of scriveners usually kept physically separated from the newsroom lest their ponderousness induce such sagging in the floor as to tilt to the whole newsgathering operation. He may have been a reporter once, though from his self description it seems likely he was a bad one. Even more, Bora, consider the source! We’re talking The Wall Street Journal here. The Op-Ed pages! Everyone in journalism knows what that means. This is the fiction section of the paper, the place where the prematurely aged (you got that one right) gather to spin fables that comfort in the face of an obdurately resistant reality. The Journal’s opinion pages bear the same relationship to journalism as the Discovery Institute does to evolutionary biology. Getting shocked at stupidity published there has the same utility as getting furious at this specimen. Anyway, who cares what a minor figure in a not exactly on-point segment of the business (remember — editorialists are not reporters) thinks about this stuff. It is clear that the future of mass communication in general, and news gathering and dissemination in particular is going to be digitally mediated and deriving from a range of sources, from full time pros to various sorts of part timers/users/amateurs/citizens whatever. It’s done. A cri de coeur like that of poor Mr. Mulshine are keening at the loss, not an actual argument to be addressed. Where I do think Bora gets it a bit off, or perhaps just does not express himself precisely here is in his disdain for professional knowledge and experience in journalism as a craft; he seems to think (a) that beat reporters are not or do not become expert; (b) that reporters see themselves primarily as gatekeepers, and (c) that editors are pretty uniformly the enemy of discourse. All of these can be true, and I’ve seen instances in my own career. But without going into chapter and verse it’s easy to denigrate the knowledge and craft of folks doing work outside one’s own field. Reporters and editors do provide certain critical functions that are already being translated into new models of so-called citizen journalism. That is: two things that organized media (think John Gotti?….) do, or ought to, is aggregation and q.c. ; the third function, and the one that Mulshine, ineptly, is trying to highlight, is that of devoting full time resources with presumptively undivided attention to critical subjects, regions, or stories — that is a big issue for the blogosphere, but there are already plenty of models to show how this can be done. Just ask Josh Marshall. Those first two functions are editorial, rather than reportorial. The construction of a model of editing that enables rather than constrains citizen journalism is one of the actively pursued challenges taken on by a lot of those ink-stained wretches who take the new media seriously. Two of the best I know are my old college room mate, Michael Skoler, trained up as a radio reporter on the science desk of NPR, now head of the Center for Innovation in Journalism at American Public Radio. Michael developed Minnesota Public Radio’s model of public insight journalism which forms a collaboration between citizen journalists — thousands of Minnesotans, and MPR’s professional staff. Another old friend, Ellen Hume, trained up at the Wall St. Journal — on the real side of the paper, not the opinion sandbox — worked as a true establishment MSM type as a Washington correspondent and TV gabber, and now runs MIT’s Center for Future Civic Media, which is a pursuing more technology centered research on the creation and use of new tools to develop, and disseminate information for both traditional news-gathering purposes and for other civic/political goals. The point: both Michael and Ellen, and many others come at this with a very deep background in journalism; they’ve spent decades each trying to find, construct and share stories that in some cases cost them dearly to get. This knowledge is useful; easy disdain for that hard won experience makes for good blog posts. It does not correspond to the reality, which is that the good journalists out there see in the new tools and new sources of information (that’s all of us here in the blogosphere) enormous advantages they could have used back in the day. All of this is prelude to the argument I want to take some time to craft, which is to push back– not all the way, but partly — on the notion that the blogosphere in and of itself is sufficient to take on the role traditional journalism has (at least in myth) played in the past. The reason why efforts like those undertaken in Minnesota and across the way from my office matter is that in a finite day the ubiquitous and self-correcting nature of what might be called the informal journalism of the internet exists synoptically — but people don’t. They — I, we — have finite time to perform the editorial work of chasing down contending versions of reality until some resolution sets in. We have only so much time to put together the range of stories we might find interesting or important in each day. Someone will take care of all that, whether it be some part of the civic journalism movement, or mutating mass media. If we don’t create and use the tools that make the totality of our efforts accessible, then it seems to me likely that people like Rupert Murdoch et al. — who aren’t dumb, not matter what other qualities may attach themselves to them — will create the filters, packaging, production values and aggregation work that will capture much more of a share of audience than they should. More on that soon, though I think I am due (and you too) a little break from this topic. 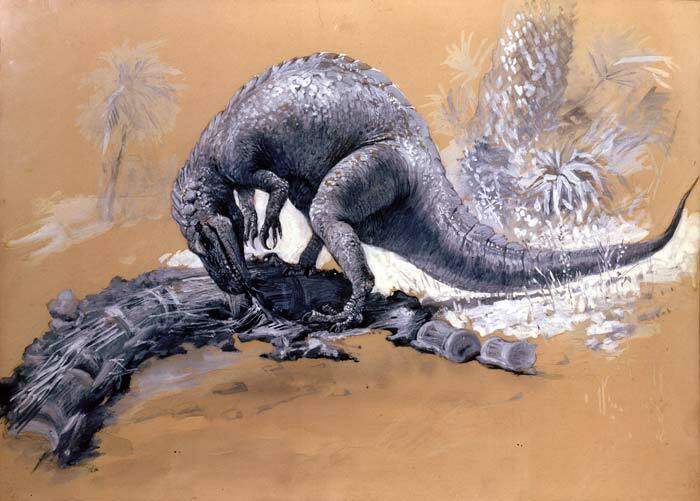 Image: Allosaurus on lunch break. This entry was posted on December 30, 2008 at 4:13 pm and is filed under journalism, Journalism and its discontents, science writing. You can subscribe via RSS 2.0 feed to this post's comments. You can comment below, or link to this permanent URL from your own site. Thomas – Excellent post. Several points, in no particular order. Talking Points Memo is in some sense the exception that proves the rule. It’s frequently held up as an example of a new media alternative to traditional paper publications. But its newsroom is a fraction of the size any major national publication, which means that it is only able to cover a fraction of the number of important topics. And – crucially – it has chosen a national niche. There are no (or very few) regional- or local-scale alternatives, despite enormously creative efforts in a variety of cities. What TPM demonstrates is that it takes national reach to make that model work, and local and regional reporting cannot be replicated that way. One of the central problems with the shift away from the sort of mainstream media where I spend my days to web-based alternatives is the self-selected nature of the audience(s). The recent kerfuffle over the decision of CNN to abandon its science team is a great example. CNN or not, there is an extraordinary flowering of good science journalism in the Web, much of it written by scientists themselves. The science blogosphere is one of the best examples of participant journalism. To those using the web to look for great science, CNN will not be missed. Those who bemoan the loss of CNN’s science coverage are not bemoaning a loss of science coverage. They are really bemoaning CNN’s ability to get science in front of a general audience that would not otherwise self-select for science journalism. The reason I, as a science journalist, remain stubbornly wedded to the old model is because of the ability it offers to get important science topics before the non-sciency audience. I’ve spent a great deal of time with feet in both new and old worlds, and nothing in the new media world has been able to duplicate my ability to reach and communicate with the non-science audience as well as the old paper-on-driveway approach. I realize the failings of the old model, and I am steeling myself to bid it a fond farewell, but I’ve yet to find a workable replacement.